This oral history project is designed to preserve the history of the people who spent their careers preserving the history of North Dakota and its communities. The following video clips are highlights from in depth interviews of North Dakota journalists. The clips also are on display on an electronic kiosk at the new North Dakota Heritage Center in Bismarck. The full video interviews are preserved and are available for viewing at the North Dakota State Archives at the Heritage Center. Additional oral history interviews will be added to the collection as they are completed. Andrist (1931-2018 ) grew up working for his father, Calvin Andrist, at the Divide County Journal in Crosby. After taking over the family newspaper, he began climbing a ladder that would take him to the presidency of the North Dakota Newspaper Association and eventually the National Newspaper Association. He continues to write a weekly column that first appeared in the late 1950s. In 2002, he received the Amos Award, the National Newspaper Association's highest honor, for distinguished service to the community press. He is a recipient of the North Dakota National Leadership Award of Excellence, presented by Gov. George Sinner. After many years on the board of the North Dakota Newspaper Association Education Foundation, he was bestowed with honorary lifetime membership. He also achieved lifetime membership with the Society of Professional Journalists, and is enshrined in the North Dakota Newspaper Hall of Fame. After selling the newspaper to his son in 1991, he was elected to the North Dakota Senate and served continuously through 2014. Marcil started his newspaper career as a retail ad salesman at The Forum in the early 1960s and by 1969 was promoted to president and publisher. Under his leadership, Forum Communications Co. grew to include 10 daily and 30 community newspapers in three states, five commercial printing plants, four TV stations and a radio station. In 1983 became the first North Dakotan elected Chairman of American Newspaper Publishers Association (now Newspaper Association of America), and moved on to become chairman of the U.S. Chamber of Commerce, and later chairman of the Greater North Dakota Chamber. He is a past president of the North Dakota Chapter of Sigma Delta Chi and Fargo Chamber of Commerce, and has been a director of the North Dakota Newspaper Association, the Northern Lights Council of the Boy Scouts of America, United Way of Fargo-Moorhead, and the Minnesota State University-Moorhead Development Foundation. Marcil received the alumni achievement award from UND in 1990; the Ralph D. Casey University of Minnesota Award for Distinguished Service in Journalism in 1993; an Honorary Doctorate of Letters from North Dakota State University in 1993; and the Schafer Excellence in Enterprise Award from the University of Mary, Bismarck, in 2003. After many years on the board of the North Dakota Newspaper Association Education Foundation, he was bestowed with honorary lifetime membership. He also is enshrined in the North Dakota Newspaper Hall of Fame. 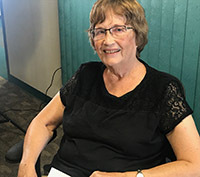 Hagerty (1926 - ) began her newspaper career in the 1940s when she was a high school student and worked for the Pierre, Capital Journal in South Dakota. 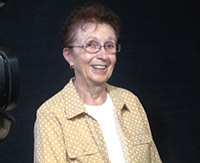 She started working at the Grand Forks Herald in 1957, when her late husband Jack Hagerty became editor of the paper. By the 1970s, Hagerty had a regular column, and she also began a column of historical reminiscences, That Reminds Me. She was reviewing restaurants at least by mid 70s. She retired from full-time newspapering in 1991, but soon resumed writing five columns a week for the Herald. Hagerty appeared in various national media in 2012 when her review of a new Olive Garden restaurant in Grand Forks, was noticed by online news aggregators and became an overnight sensation among both critics and admirers. She was awarded the 2012 Al Neuharth Award for Excellence in the Media. 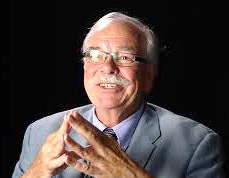 Roger Bailey was inducted into the North Dakota Newspaper Hall of Fame in 2014. That came nearly 50 years after he learned to operate the Linotype and the presses at a small letterpress newspaper his parents operated in Bertha, Minn. In college at Moorhead State he was reporter, editor and student advisor of the student newspaper, and after graduating he held several jobs at KTHI-TV in Fargo -- including weather man. In 1973 he became editor and publisher of the Turtle Mountain Star in Rolla, and turned it into the largest circulation and most decorated weekly newspaper in the state. In 1982 he served as president of the North Dakota Newspaper Association. He sold the Turtle Mountain Star in 1998, then spent 13 years as executive director of NDNA. With him through it all was his best friend and wife, Ingrid. 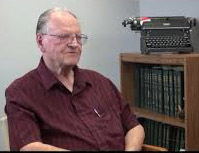 Richard Peterson’s affiliation with the Benson County Farmers Press in ‘Minnewaukan started in 1959 while he was in college and continued until 2014 when he sold the newspaper and retired. Richard’s association with the Farmers Press wasn’t continuous, because he took time out to get an economics degree, and later to serve a three-year hitch in the Army, including service in Vietnam. He returned to edit the Farmers Press in August of 1970, added the publisher title a month later, and continued to operate the Farmers Press until his retirement. During that time he was a community leader in ‘Minnewaukan, including a stint as mayor, and was known for his weekly column. Bob Lind was born in Grand Forks, served in the U.S. Army from 1952-1955, and graduated from the University of Minnesota in 1957. His newspaper career began as editor of the Spring Valley (Minnesota) Tribune from 1957 to 1961. From 1961 to 1968 he owned and operated the Larimore Pioneer in North Dakota. He joined The Forum in 1969 and has been a copy editor, night editor, assistant city editor and features writer. He retired in 1998 but continues to the write The Forum’s popular “Neighbors” feature several times each week. Brandt (1940- ) arrived in Hebron in 1965 intending to be a stay-at-home mom while her first husband pursued his newspaper career at the Hebron Herald. The arrangement lasted three days. Called in to help, she hasn’t left the paper since and took sole control of the weekly in the early 1970s. Soon after, she also became publisher of the Richardton Merchant. Throughout her career, Brandt was active with the North Dakota Press Women/ North Dakota Professional Communicators and was honored with a national Communicator of Achievement award. She co-published In the Beginning, Hebron, North Dakota, 1876 to 1912, and helped compile a 600-page book of photos and family histories for Hebron’s centennial. Once a stranger who didn’t understand the German spoken in town, Brandt has dedicated more than five decades to recording and preserving the history of these small western North Dakota communities. Jacobs (1947- ) published his first newspaper, the Jacobs Journal, as an eighth-grader, a foreshadow of his rise to become one of the state’s most prominent publishers. Before taking control of The Grand Forks Herald in 2004, Jacobs worked as editor of UND’s Dakota Student, reporter for The Dickinson Press, managing editor of the Morning Pioneer in Mandan, and publisher of The Onlooker. In 1979, he began his long career with the Herald as the Bismarck bureau reporter, eventually becoming editor and publisher in Grand Forks. As editor, Jacobs guided his team to a Pulitzer Prize for the Herald’s coverage of the 1997 flood. In 1998, he received the National Press Foundation’s Editor of The Year Award. Well-known for his political commentary, Jacobs continues to support the newspaper industry in North Dakota after retiring from The Herald in 2014.
assistant city editor and features writer. Ness (1935- ) continues the newspaper legacy established by his father G.K. Ness in Fordville in 1922 and today publishes 10 small community newspapers in eastern North Dakota. Ness began his long newspaper career by helping his father with printing work during his teenage years. After attending college at UND, he was drafted and spent two years in the Army. In the early 1960s, he and his brother Gunnard took over the family business, where he has remained since. He now oversees publication of the Tri-County Sun in Fordville, the Adams Standard, the Aneta Star, the Edmore Herald, the Hatton Free Press, the Larimore Leader/Tribune, The Messenger in McVille, the Nelson County Arena in Michigan, and the Pembina New Era. Ness believes it’s good for a town to have its own identity and that a local newspaper helps keep a community together. NDNA recognized Ness for his 50 years of service to the industry in 2010. Sailer (1948- ) started at The Dickinson Press in 1970 and expected to stay just a few months until she began her intended career as a teacher. Nearly 50 years later, Sailer is unmistakably the heart and soul of the paper not only due to her long tenure but her excellence in lifestyle reporting. Sailer began her journalism career by typing obits and stories on a little typewriter before transitioning to lifestyles editor and reporter. Her coverage has ranged from a veterinarian who built a house out of straw to numerous Make-A-Wish stories to features arising from the 1980s and 2010s oil booms in western North Dakota. Sailer is proud of her work in “soft news,” believing these stories change people’s lives and allow her to provide a voice for her community. She has received top awards from the National Federation of Press Women and won the state Communicator of Achievement award from the North Dakota Press Women. Videography by: Forum Communications Co. The full video interviews are preserved and are available for viewing at the North Dakota State Archives at the Heritage Center. Additional oral history interviews will be added to the collection as they are completed.